Previously, on Vexed by Convexity, we looked at various measures of convexity as applied to the pentominoes. 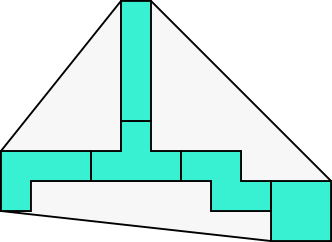 In order to turn these measures into interesting puzzles, we can try to minimize their values for some family of polyominoes. 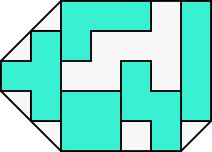 Arrangements of tetrominoes were one that I found to make good puzzles. But we can cheat. If we check only segments connecting the centers of squares, we have a reasonably bounded quantity of segments to check. This is at the expense of no longer having a valid convexity measure (for example, this method would find the P pentomino to be convex.) But that’s fine; what we really care about is just having a good puzzle.